Маша и Медведь. Очень детективная история. in Academic National Drama Theatre buy tickets online. Delivery of tickets for the event Маша и Медведь. Очень детективная история..
Маша и Медведь. Очень детективная история. 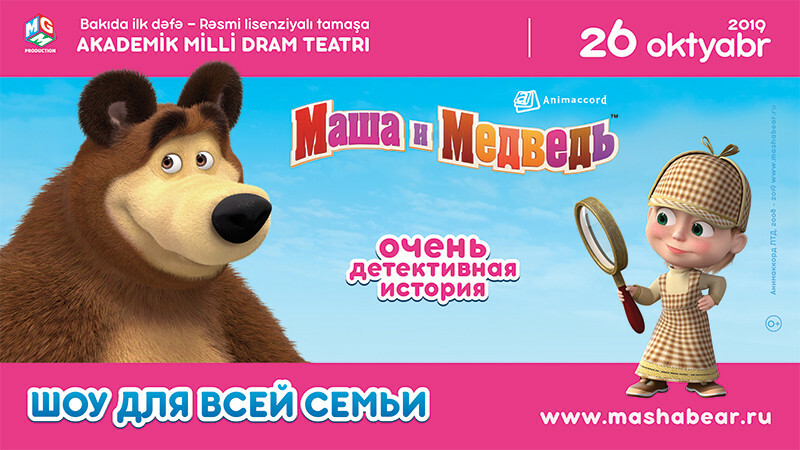 For the first time in Baku - the official licensed staging from the creators of the animated hit "Masha and the Bear"! Fascinating interactive performance for the whole family from the general producer of the super popular cartoon series delivered by professional directors, choreographers and real magicians illusionists. The performance is accompanied by the author's music, incendiary dances, acrobatic performances and exciting scenes. Throughout show viewers are full participants in the action - they are directly involved in the plot. and favorite tunes, as well as new wonderful songs performed by Masha. Free admission: up to 5 years, no-occupied a separate place, accompanied by a parent.